Should Minnesota Require Rooftop Wind? California has mandated rooftop solar units be placed on every new home built in the Golden State. Given Minnesota winters aren’t as conducive to rooftop solar as sunny California, should Governor Walz push for similar measures in Minnesota, only requiring rooftop wind turbines for new and existing homes? The short answer, obviously, is no. I’ve posted an article from engineering.com to demonstrate just how terrible such a mandate would be. Wind turbines are advertised with a rated power. Small turbines, like those you’d see on a roof, are generally rated at 400W to 1kW. So you might do a quick mental calculation and guess that the 1kW turbine would generate 24 kWh of energy each day (1kW x 24 hours.) Well, that would be true if the wind were blowing constantly at the rated wind speed. But the fact is, neither of those conditions are likely to occur on a rooftop. The curve shows that the turbine starts generating power at around 3 m/s (6.7 mph) – the cut-in speed. Slower winds don’t have enough power to make the rotor spin. As wind speed increases, there’s a rapid increase in power, but the power output only hits 1 kW (the rated output) when the wind speed is around 11 m/s (nearly 25 mph). To put that into perspective, if your land had average wind speeds of 25 mph, all of your trees would be permanently bent. It’s more likely that you’ll see winds in the 3 to 5 m/s range, which means that a 1 kW turbine is usually producing less than one-tenth of its rated value. The shut-down speed is the speed at which the turbine will apply a braking mechanism to prevent damage. A typical shut-down speed is just a few m/s higher than the rated speed, so the “sweet spot” – the range where the turbine produces its rated power – is pretty narrow. I recently saw a study that said rooftop turbines should be mounted near the center of the roof rather than along the perimeter, because turbulence is greater around the outside of the roof than in the center. Fair enough, but that study only looked at turbulence, not overall production. Following its recommendations means that your turbine will last longer. That’s a good thing, because it could take a very long time for the turbine to generate enough electricity to offset the cost of the turbine itself. A better suggestion is to avoid putting wind turbines on the roof. In the Intro to Sustainable Energy class that I teach, we do an exercise to calculate the payback period of various small wind turbines. I won’t mention brands, but we chose a 400 watt horizontal axis wind turbine (HAWT) and a 1 kW HAWT. And we didn’t bother with a rooftop installation – we went with a 10 m (33 ft) tower, since higher altitudes are where you get the sustained winds. In northern Illinois, the average winter wind speed at 10 m is 3.6 m/s, or about 8 mph. With 3.6 m/s winds, the 400W turbine generates 50W. Assuming it runs 24/7/365, the turbine will generate 438 kwH per year. The national average electric rate in the US is $0.12/kWh, so the turbine saves the owner $52/year in electricity cost. A typical 400W turbine costs about $400 – and that’s just the turbine, not the tower. The least expensive tower kit that I could find sells for just under $400, not including the concrete base. So at a minimum, it costs upwards of $800 for one of these turbines and its tower. That’s more than a 15 year payback period, which wouldn’t be terrible for a long-term investment, except that the turbine comes with a one-year warranty. A popular one kilowatt turbine with a better warranty will generate 77 watts with a 3.6 m/s wind speed. That gives 675 kWh each year, reducing the customer’s annual electric bill by $81. The turbine sells for $4400 without the tower, and this turbine is much heavier, so it requires a stronger tower. 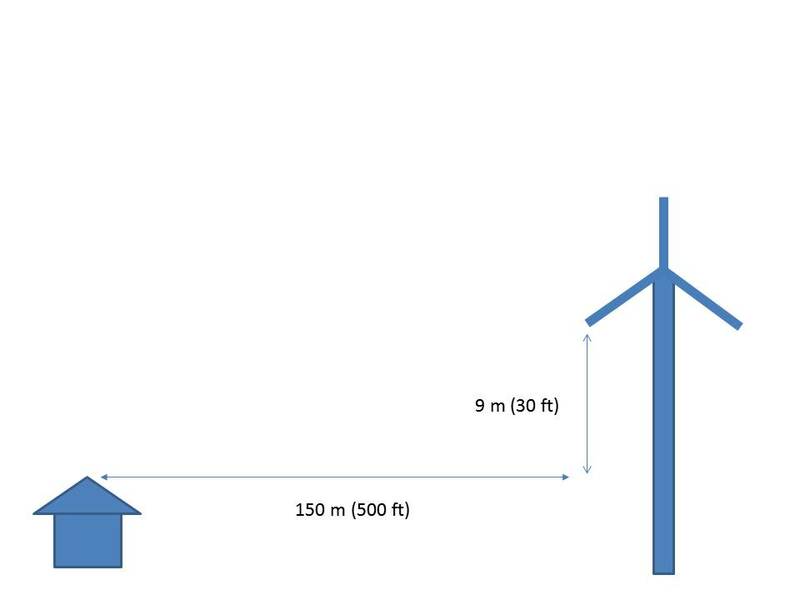 In general, the cost of a tower is about the same as the cost of the turbine, so the investment is close to $8800. If Bilbo Baggins’ parents bought one of these on the day he was born, it would pay for itself around the time of his “eleventy-first” birthday. Oh, I didn’t even get into the cost of professional installation, which could be $2000 or more. What If the Grid Isn’t an Option? It’s easy to say that these turbines aren’t worth the money when compared to grid power, but what about remote locations where grid power isn’t available? Let’s look at the 1 kW turbine and tower for $8800. We determined that it produces 675 kWh per year. Is there a better renewable source of energy? Solar? In the same location, the average solar resource is 4.5 peak sun hours (PSH) per day, with a worst case of 2.6 PSH in the winter. To generate 675 kWh/year, a photovoltaic (PV) array would need to produce 1.85 kWh/day. In the winter, a 1 kW solar array would cover that, even if the overall system were only 75% efficient. (85% is a more realistic number.) A small PV system costs about $4/watt installed, so the total investment, including installation, is about $4000. Even better, the PV system has no moving parts so it requires no annual maintenance. When I crank the numbers, I just can’t see any reason that a homeowner would go with a small wind turbine when PV is a better option. Wait … I can think of one: I have a sister-in-law who lives in Alaska!